In the extreme south of Chile is a natural attraction that was classified by National Geographic magazine as the fifth most beautiful place in the world: Torres del Paine, a small and imposing group of granite mountains, located in the National Park that leads the same name. This is the third protected area with the most visits throughout the Chilean territory and an attempt to describe the reasons for seeing it will always be insufficient. The height of the Towers is not yet defined, although it is known that range between 2000 and 3000 meters. One of the most striking features is how the snow has molded the sides of the mountains in its path, leaving concave, flat, convex and rough forms. In addition, it’s spread around various ecosystems that coexist harmoniously in a territory of more than 200,000 hectare. So a visit to Torres del Paine must last at least three days, not counting the time you want to spend knowing the nearest cities that will serve you as a stopover: Puerto Natales or Punta Arenas. An excellent option, recommended for the more adventurous and sports, is to know the Park through circuits that travel different areas every day, with lodging in different places. These tours usually involve activities such as hiking, horseback riding, mountaineering, climbing and/or camping, although in the extreme cold of the night it is best to rest in hostels. 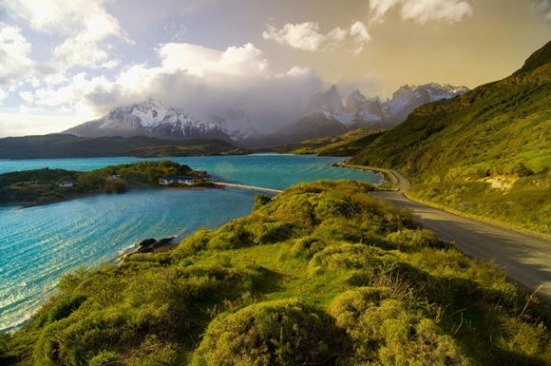 Any route necessarily passes through Torres del Paine, because it is surely one of the main reasons that motivate tourists to know the end of the world, but also visit winding rivers, wide valleys fed by the waters of calm lakes and dreamy glaciers which have become the symbol of Patagonia. On the other hand, the Park has a good system of tracks that reach various hotels and shelters, so another option is to base one of these accommodations and from there manage daily tours to the attractions that you prefer. If you choose this alternative, it will be easier to access activities such as kayaking or sport fishing, roasting (in places reserved only for this purpose), or having a good time in calm while being enveloped by the beauty of the landscape. As already mentioned, one of the starting points to reach this destination is Punta Arenas. The ideal is to get there by plane and, after a day or two, take the road to the Park which is just over 300km away. This city – port has several important attractions, such as the historic Strait of Magellan, where you can see the famous Patagonian penguins. In addition, in the urban area there are very interesting museums and cultural centers, such as Nao Victoria. If you prefer to travel to Puerto Natales, which is much closer to the Torres del Paine (a little less than two hours), you will surely find many more tourists who are in the same plan, since it is considered the gateway to the Park. In the city there are not many attractions, but if you offer a number of tours to its surroundings. In addition, it has a wide range of tourist establishments if you prefer to spend the night here. If you are in Chile, take advantage, and if not, think seriously. Visit Torres del Paine National Park is one of the most rewarding and wonderful experiences you can enjoy in your life.